"Trailer" Drake McWhorter is a YouTuber and one of The Game Theorists YouTube channel. He is the co-creator of the internet series Crossover, where he and his artist/assistant, Kenny Landefeld, explain how all video games are connected through stop-motion avatars. 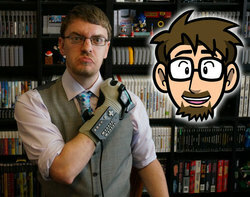 Besides working on The Game Theorists, he works on two channels of his own. His personal channel TrailerDrake, is devoted to Top 10 and episodes of his show, Unpopular Gaming Opinions. He also has a channel dedicated to comic books simply titled ComicDrake. On August 26, 2014, Drake started a new series on the The Game Theorists channel known as Smash History, where he explains where the details of the Super Smash Bros. franchise originate from earlier games.